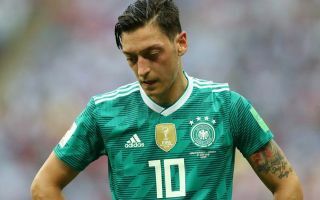 Former Arsenal goalkeeper and coach Jens Lehmann has offered some insight into why Mesut Ozil had such a disappointing World Cup with Germany this summer. The Gunners playmaker made minimal impact for Joachim Low’s side in Russia this summer as they suffered the humiliation of an extremely rare group stage exit. Germany won the tournament just four years ago and were seen again as one of the favourites this time, but they suffered a shock 2-0 defeat to South Korea yesterday to finish behind Mexico and Sweden in their group. Ozil as ever has been one of the targets for criticism, and Lehmann admits he saw it coming as he had a close look at Ozil’s fitness and form during his time on Arsenal’s coaching staff last season. The former Germany international has since left the club, but has been quoted as saying he noticed Ozil’s preparation for the World Cup was far from ideal. ‘Obviously I saw that (criticism) from a very close distance last year,’ Lehmann told radio station talkSPORT, as reported by the Daily Express. ‘And what comes out is that if you want to play a good World Cup it doesn’t start two or three weeks before the World Cup. ‘It starts actually at the beginning of the season ahead of the World Cup. You need to find your rhythm you need to have a good pre-season. ‘You need to practice a lot, you need to participate in training sessions, and unfortunately Mesut has been prone to injury quite a lot. ‘I remember the last three games for Arsenal he couldn’t play and he couldn’t even train. ‘In January and February in the winter he didn’t have a lot of training sessions.